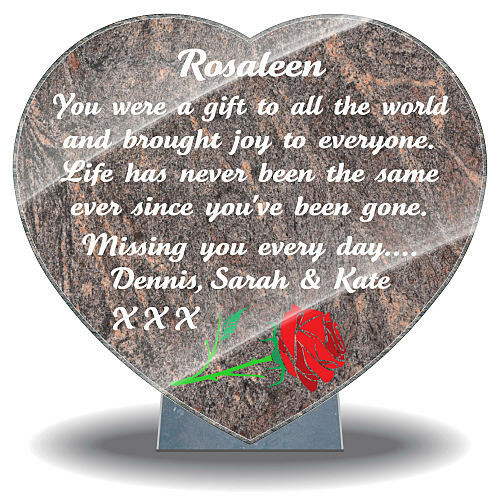 Our memorial gifts for loss of wife shows a single red rose etched in color on a granite heart-shaped plaque. Also, a memorial poem or verse is engraved alongside. In addition, you can add your own personal inscription. You can also upload your own unique image if needed. 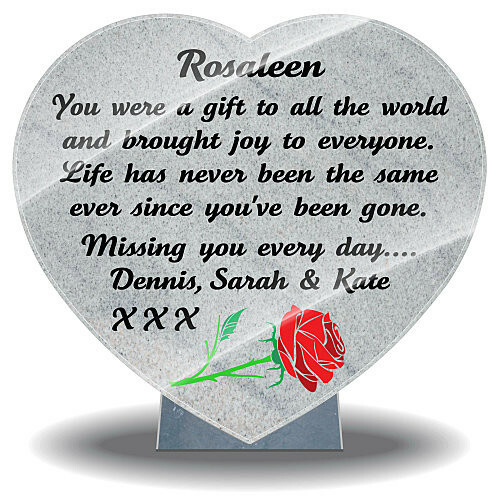 This memorial gift is available in four colors and two sizes. After you make your purchase a proof of your memorial gift will be sent to you for approval. 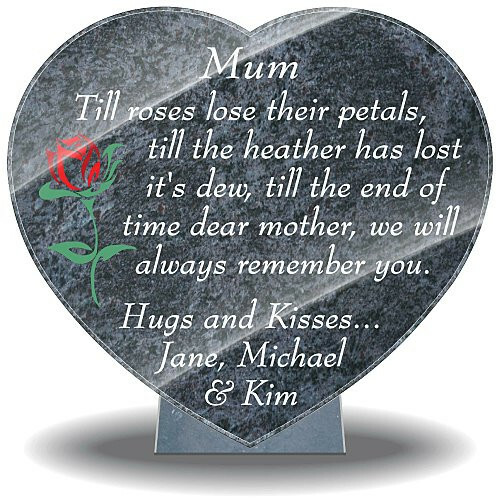 Our memorial gifts loss wife shows a single red rose on a granite heart-shaped plaque. In addition, engraved alongside is a short memorial poem for mother or wife. 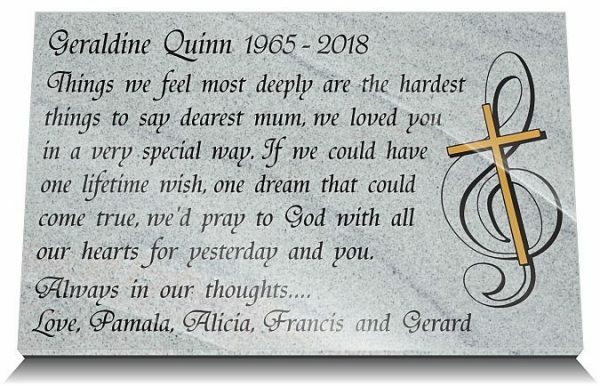 This memorial gift is available in four granite colors. Each plaque has a highly polished finish and a stand securely fixed on the back. Therefore allowing the plaque to rest at an angle when placed in position. 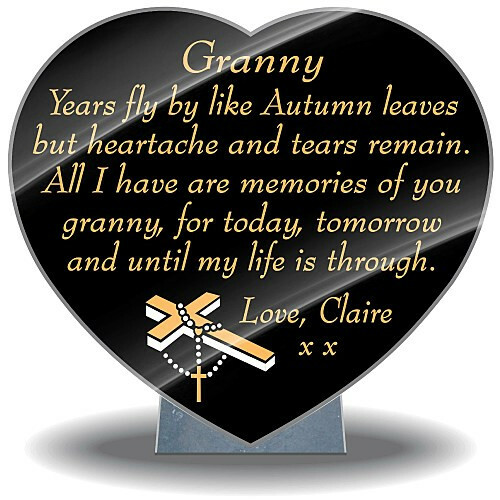 Made from granite our memorial gifts loss wife are extremely durable. Furthermore, they are created to withstand all types of outdoor climates. Delivery time to Ireland and UK is seven working days. Consequently, the USA and other countries have a delivery time of ten working days. Most noteworthy this memorial comes with a lifetime guarantee. First of all select the color and size of heart plaque that’s most appropriate for you. 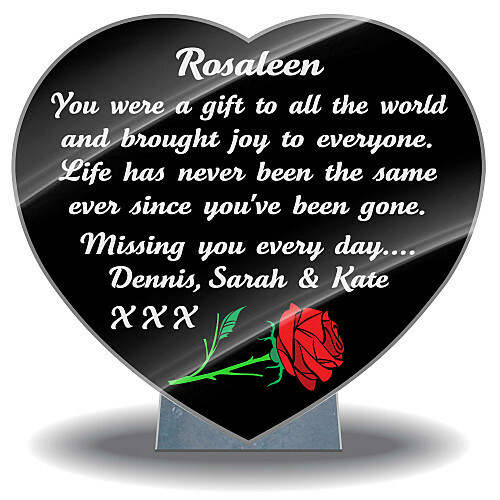 Change the inscription on our memorial gifts loss wife by adding your new wording in the personal message box above. Similarly, upload your own image and we will edit it accordingly. Also, view a memorial poem for mother or wife for some inspiration in choosing an appropriate verse for your memorial gift. Furthermore, after you submit your inscription and upload your new image (if needed) continue to the checkout page. Finally, add your contact details and make your purchase. We will then send you a proof of your memorial for your approval. 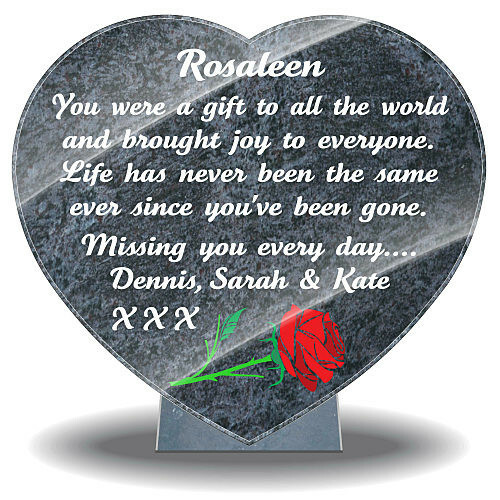 Above all contact us for any questions regarding how to personalize or order your memorial gift.